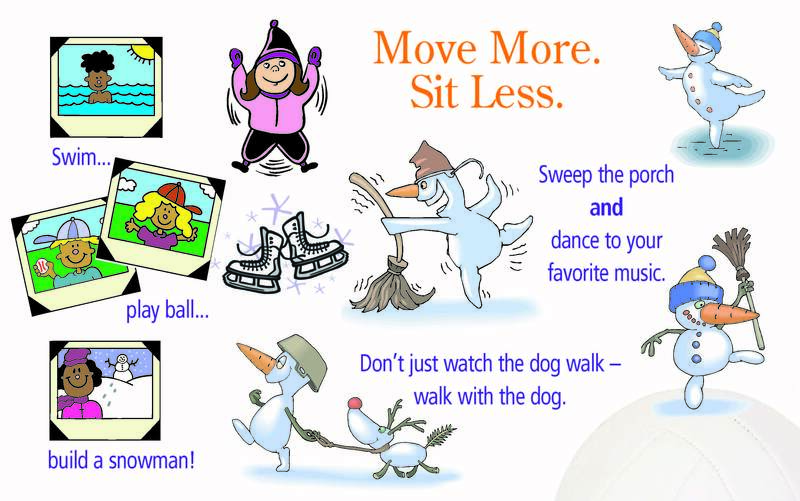 SitLess – Move More !! Hope all of you are enjoying this upcoming holiday season. 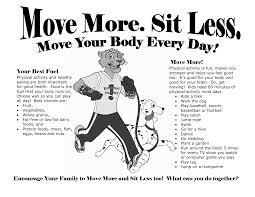 Here’s a health reminder on not sitting too much – Move More !! 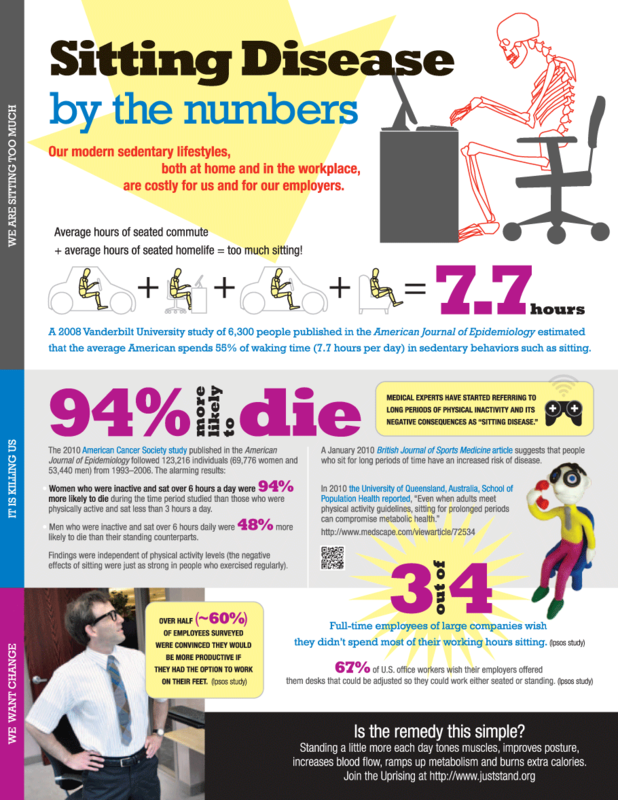 “Sitting,” says Dr. James Levine, an endocrinologist at the Mayo Clinic who has researched the dangers of a sedentary life for the last 15 years, “is the new smoking.” Levine’s studies have shown that sitting around—as many of us do for both work and pleasure—is bad for your health. Spending more than just 6 hours a day on your backside drives up blood pressure and places you at a greater risk for diabetes, obesity, depression, and some types of cancer. People who already have chronic illnesses see an increase in their symptoms. And that’s just for starters. Think you’re out of danger if you go to the gym regularly? Think again: The usual guidelines for regular exercise simply aren’t enough to counteract the dangers of all the sitting we do. And we do a lot of it: Americans average 9.5 hours on our collective butts per day. That’s a lot of smoking. So maybe it’s possible to limit our time on the couch. But when you make your living sitting at a desk, what’s to be done? The answer is NEAT—nonexercise activity thermogenesis. In other words, getting up and moving around, at an easy pace, as often as possible, for as long as possible. NEAT used to be far more interwoven into our lives: Walk to the post office. Walk down the hall to confer with a coworker. Walk to the market and walk back with the groceries. These days? Not so much: Technology allows us to do almost everything from the comfort of a chair. This may help to explain why we’re getting so much heavier than the Americans just a few generations back, even as we have become more and more obsessed with fitness. Our grandparents certainly didn’t have a big-box gym on every corner. As a group, in fact, people probably got less formal exercise than we get today. Without the conveniences of e-mail and other labor-saving technologies, day-to-day lives simply required more movement 50 or 100 years ago. And since even slow walking can more than double your metabolic rate compared with sitting, you can see how being just a little more active during your day can make a huge difference to your weight and health. Still don’t think walking “counts” as exercise? A 2004 study of the Amish—a modern agrarian culture that shuns post-industrial revolution technology—indicates that as a group, they’re remarkably healthy: Cancer rates are far lower than those of the country at large, and obesity is almost nonexistent, despite a conspicuous lack of treadmills and weights in their communities, and a diet rich in meat, pie, refined sugar, and other fattening foods. Their apparent secret? High amounts of NEAT: Amish women take about 14,000 steps a day, and Amish men are up around 18,000—something on the order of 8 miles a day. I’m not suggesting we dispense with all technology and live like the Amish. But I am saying we need to figure out ways to make our own NEAT. You’ve may have heard this fitness tidbit before and dismissed it as impractical. Who has time for all that walking? The surprising answer: You do. Even if you don’t want to spring for a treadmill-desk (they do exist! ), there are lots of ways to sneak more easy, focus-building, nonsweaty NEAT into your life. As a culture, we conduct most of our business and social affairs from a seated position: in restaurants, boardrooms, and coffee shops. Whenever possible, find ways to turn these into walking meetings—especially when you’re meeting one-on-one: Offer to stroll in the park or around the block rather than sitting down and eating something you probably don’t need. You’ll eat less, move more, and probably even think better: Walking can help your ideas flow. Many of us who grew up with desktops and wall phones are still stuck to the idea that we have to be stuck while using mobile devices like cell phones and laptops. So we sit at a desk while chatting on our cell phone or working away on a laptop. Whenever you’re on the phone, take it as an opportunity to walk—or at least stand. Most people feel—and sound—more engaged when they’re on their feet, so you’ll make a better impression on the phone if you’re up and about anyway. And change locations with your laptop whenever possible: Take it to a park, a cafe, another room in your house. One of the reasons it’s so tough to maintain good posture at a desk is that your ligaments and other soft tissues start to deform after about 20 minutes in the same position, gradually giving your body a permanently chair-shaped appearance. Fight this tendency with 1- to 5-minute breaks for every 20 minutes you’re at work: Stretch, breathe, focus your eyes on a distant object. You’ll come back to work refreshed and recommitted. This falls under the no-brainer category: Grab the first parking spot you see in the lot (the farther away from the door, the better) rather than circling for 10 minutes looking for the perfect one. Take the stairs, not the elevator. And stay off the human conveyor belt at the airport, too: You’re going to be stuck on a plane for 6 hours anyway—do you really need less activity? Whenever there’s a choice—walk. This may seem like novice advice, but it can make a huge difference in the number of calories you burn in a given day. 5. Miss your stop … on purpose. If you use public transportation, try getting off a stop before or a stop after the one most convenient to your destination. You’ll be able to squeeze in 10 or 15 minutes of pleasant walking—and maybe get to know your neighborhood a little better at the same time. 6. Go for Face Time (not the app). I’m lucky that my profession requires me to see people face-to-face: It’s hard to diagnose a torn meniscus or a separated shoulder over e-mail. But many people can go through their workday without ever actually interacting with their closest coworkers. They text the guy down the hall, they e-mail blast to their most valuable clients. Nothing wrong with convenience. But if you’ve got a question for Linda, and she’s right down the hall, take the 3-minute break and go see her. Chances are you’ll communicate better anyway. In the movie Wall-E, the people of the future live on Barc-o-lounger-shaped scooter-chairs that zip them from place to place, dispensing a never-ending stream of soft drinks into their big-gulp-size cups. It’s not too far off from where we appear to be headed right now. Efficiency, it seems, is killing us. One novel solution is to get a little inefficient on purpose: Set up your work station so you have to reach for things rather than keeping them within an arm’s reach. Put the file cabinet and wastebasket a ways away so you have to walk over to them (or at least practice your free throw). Reaching, stretching, extending, and of course, walking feel great, especially when you’ve been stuck in the chair all morning. 8. Leverage your TV time. I personally don’t know anyone who admits to watching more than an hour of television a day—but with the national average up around 5 hours, I know they’re out there. TV time can be invaluable for stretching, floor Pilates, and yoga postures. No need to make it super intense: Restorative postures are great, especially if you’re winding down before bed. You’ll sleep better, burn a few calories, and shave some time off your sitting hours for the day. And you’ll relieve a little of the guilt from your favorite guilty pleasure. This applies to any fitness venture: a better diet, a more stringent workout program, a more active lifestyle. Don’t go it alone. Make sure everyone near you—especially your family—knows that you’re trying to get more activity into your day, and include them as much as you can in the effort. Take a walk around the block instead of a trip to get fast food; play mini-golf instead of going to the movies; choose Twister instead of video games. It’s OK if you’re not a superathletic family—you don’t have to shoot hoops and shag fly balls every night. But the more incidentally active your family activities can be, the better. And you’ll be instilling the importance of regular movement into your kids’ lives—and that’s a pretty important gift. Excerpts from The Exercise Cure by Jordan D. Metzl, MD … Excellent Read !!! Here’s to Moving – Living a Boundryless Life ! !